The Financial Times has signed up a host of guest bloggers for it’s coverage of this week’s World Economics Forum (WEF) in Davos, Switzerland, which starts tomorrow. Sir Martin Sorrell, Kofi Annan and British foreign secretary David Miliband will all be posting alongside FT editors and correspondents – you can read Sorrell’s first post at this link. The site has set-up an ‘in depth’ microsite to host its coverage, which will also feature video reports and can be followed on Twitter @FTDavos. Elsewhere YouTube got its users to pose video questions to the forum via its Davos channel – the most voted submission was from Pablo Camacho, a student and independent writer from Bogotá, Colombia, who will now attend the event on behalf of the site as a citizen reporter. This entry was posted in Events and tagged Bogotá, Colombia, David Miliband, Davos, foreign secretary, Kofi Annan, Martin Sorrell, Pablo Camacho, reporter, student and independent writer, Switzerland, The Financial Times, United Kingdom, YouTube, YouTube Inc on January 27, 2009 by Laura Oliver. The BBC has made good on its October promise to launch six new video channels on YouTube in Urdu, Spanish, Russian, Persian, Portuguese and Arabic and has rolled out its Russian stream. 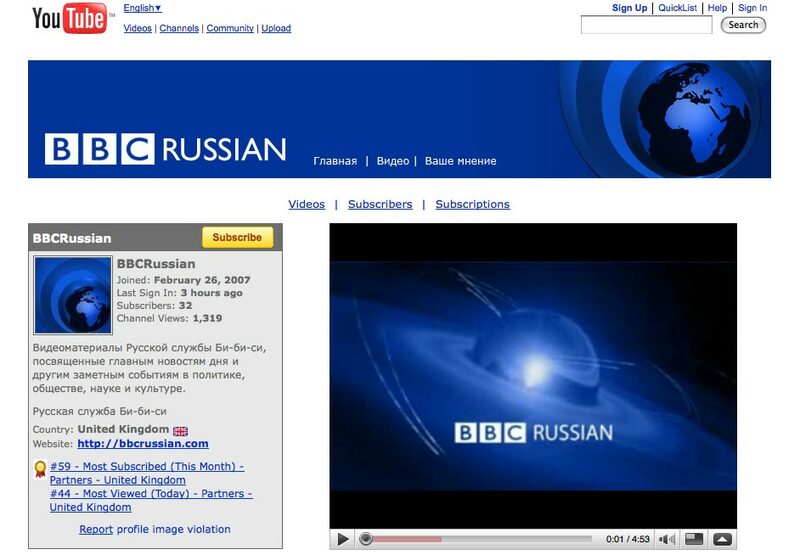 The BBC Russian YouTube channel will feature footage from BBC Russian correspondents and Russian-language reports on major news events. The other multi-language channels will be launched between now and early 2009, a press release from the corporation said. The best clips, which can be uploaded to the site’s Davos channel, will be broadcast at the forum during sessions; while the user who creates the best video, as voted for by other YouTubers, will have the opportunity to attend the event, all expenses paid, as a citizen reporter for YouTube. In a repeat of last year’s event, a YouTube booth for attendees of the forum to upload their video responses to the debates will also be available, according to a press release. This seems to be just one strand of the forum’s multimedia activities. It’s also represented on Twitter, MySpace, Facebook, Flickr and questions for press conferences can be submitted via Qik and Mogalus. This entry was posted in Citizen journalism, Multimedia and tagged BBC, BBC Russian YouTube channel, British Broadcasting Corporation, Davos, Davos channel, Facebook, Myspace, Obama administration, reporter, Russian stream, Twitter, World Economic Forum, YouTube on December 17, 2008 by Laura Oliver. The BBC has been experimenting with filing video reports from mobile phones as part of its coverage of Mobile World Congress 2008, in Barcelona this week. Then while in Barcelona he moblogged several interviews, including one with Isabella Rossellini about making movies available for viewing on mobile phones, using the footage to augment a text story by embedding a flash player in the head of the story for a nice piece of additional story telling. The MoJo approach is finding increasing favour with large news organisations. Reuters put mobiles in the hands of delegates at last month’s World Economic Forum in Davos. How long will it take to trickle down into the regional press though? My guess would be 18-24 months before we see the first serious use. This entry was posted in Journalism, Mobile, Multimedia, Online Journalism and tagged Barcelona, BBC, blogs, correspondent, Davos, dot.life technology blog, head, Isabella Rossellini, mobile phones, MoJo, reuters, Rory Cellan-Jones, Video, World Congress, World Economic Forum on February 14, 2008 by Oliver Luft.